Northern Rock Hole, Nitmiluk National Park. Where ancient rock art meets Bvlgari soap. Australian Traveller magazine heads to Cicada Lodge: the outback’s newest high-end stay. Words by Alissa Jenkins, photography by Rebecca Taylor. There’s something special about a place so remote, it’s yet to be named. A special women’s area to the local Jawoyn people known as the ‘art site’. In Nitmiluk (Katherine Gorge) National Park, just south of Kakadu in the Northern Territory’s Top End – an area that encompasses 3000 square kilometres – there are many of these. Among them is a secluded swimming hole only known in the English language as ‘the art site’. Accessible only via helicopter, this pristine pocket centres around a freshwater waterfall, surrounded by a gallery of ancient rock art, painted by the local Jawoyn people up to 30,000 years ago. Rust and chalk-coloured lines depict local delicacies like wallaby and cherabin, while figures of frizzy-haired women reveal something much more. Stunning rock art, depicting nearby food sources, such as Wallaby, in the Nitmiluk National Park. “We believe this was a place for women and these paintings were to warn initiated Jawoyn men that they had no business here,” explains Dave Paton, a personal pilot and guide to guests in the area. “You’ve got to remember, Nitmiluk National Park is only a small part of Jawoyn Country, which also takes in part of Kakadu, the south-west corner of Arnhem Land, all the way down to Mataranka. That’s 50,000 square kilometres all up, larger than Denmark and Belgium combined,” he adds. This is just one of the surreal experiences available exclusively to guests at nearby Cicada Lodge (the other stunner being the Northern Rock Hole). Opened in March 2013, it was a welcome high-end edition to the NT’s outback. Unlike other luxury retreats – owned by widespread conglomerates – Cicada Lodge (and sister business Nitmiluk Tours) is wholly owned by the Jawoyn people, so the funds generated go back into the local community. As a result, this isn’t your typical five-star stay where guests remain cooped up in remote-controlled comfort. Of course you can, if you so wish, but the focus is on getting immersed in the environment and the culture. And given the lodge is tucked away on the Katherine River, 30 kilometres from Katherine’s town centre, it’d be a shame not to. “The concept of sharing the Jawoyn culture is terribly important, and we’ve been very fortunate that this is a community that wants change, that wants to share their culture and to improve their future,” says Cicada’s marketing director, Clive Pollack. “We’re not only working to preserve the Jawoyn culture, but we’re making it commercially viable in an evolving, new-age environment,” adds Tessa Pollack – anthropologist, training manager and, incidentally, Clive’s wife. On the flipside, both Pollacks insist that the Cicada experience “all comes back to service”. As soon as I walk into the main foyer, which still has that smell of newness, I’m greeted by smiling staff and a glass of G.H.Mumm. Luggage is swiftly collected before I’m shown to my room, one of 18, and although it looks suspiciously similar to a corrugated-iron shed on stilts, there’s nothing rudimentary about it inside. A king-sized bed in every Cicada Lodge room. Polished timber floors and artworks by local Indigenous artists frame an island king-sized bed, beside which chocolates and slippers mysteriously appear each evening. A banquet of Bvlgari amenities await in the ensuite bathroom, while a private balcony overlooks native greenery above the Katherine River. But make no mistake, despite the complimentary wi-fi and poolside appetisers each evening, this is the outback. One of the area’s better-known residents is Esmeralda, a two-metre olive python. Over the last few months she’s gained a reputation for repeatedly attempting to eat a Great Dane puppy belonging to Nitmiluk Tours’ river operations manager, Anthony McKie. Guests needn’t worry though; no harm is ever done – a Great Dane pup is far too big to swallow (and so are humans, just in case you were wondering). Pythons aren’t the only local wildlife you can spot here. A family of agile wallabies have made themselves at home on the property, offering a free lawn-mowing service. They also make for cute breakfast-time entertainment. Travellers also come here to see the crocs, and the best way to do this is on a Nabilil Dreaming Sunset cruise when the gorge is at its quietest (an inclusive experience for Cicada guests staying two or more nights). 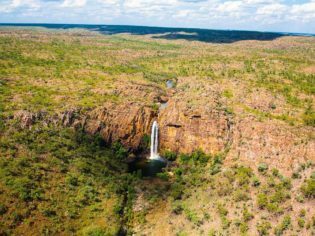 The cruise takes passengers through two of the 13 gorges that make up Nitmiluk Gorge, formerly known as Katherine Gorge. Unfortunately, we spot neither salt nor fresh-water croc, but the scenery makes up for any disappointment. As we drift along the khaki channel, jagged sandstone cliffs tower above, which could pass for an impressionist artwork at times; blobs of copper-coloured outcrops, mustard lichen and green native ferns. “The Jawoyn believe these gorges were formed in The Dreaming when Bolong, the giant rainbow serpent, slithered through the area,” says Jamie, as we reach a deep bend in the second gorge. Peregrine’s Dreaming Place tour takes in Katherine Gorge, NT. Geologically speaking, Nitmiluk Gorge is part of the Arnhem Land Plateau which is made out of sandstone, from sand carried down by a river system that was compacted into solid rock over time. Whilst there is no chocolate on board, a candlelit three-course dinner is ready as guests are transferred to another boat; this one with white table-clothed dining tables. Gliding through this prehistoric landscape we eat everything from crocodile amuse-bouche to passionfruit panna cotta, which is a gorgeously enjoyable (and surprisingly gourmet) experience. The cultural enlightenment continues back at the lodge, with a special workshop. Led by a small group of Jawoyn guides, we’re taught about the intricacies of basket weaving and making weapons, the style of x-ray painting, and the resourcefulness of bush medicine. Terrence, a young Jawoyn man forging a career in tourism, explains the significance of native plants and animals often depicted in Indigenous art. Terrence is one of the many local Indigenous people who have been recruited to work here; not through a formal recruitment agency but through the strong relationship that Nitmiluk Tours and Cicada share with the Jawoyn. Although Cicada Lodge is still in its infancy, there are already big plans underway to expand the experience. Very big. “There’s another art site that has recently been discovered in Jawoyn country, just above Nitmiluk in Arnhem Land,” says Clive, lowering his voice. The place he’s speaking of is known as ‘Gabarnmung’ by the Jawoyn, meaning ‘hole in a rock’ and it’s been found under a sandstone shelter, held up by natural pillars. “Hundreds of paintings have been protected here, paintings of kangaroos, snakes, and spirits from The Dreaming. While I try to keep up with this mind-boggling revelation, Clive explains the concern is that the pillars that hold up the shelter are in an incredibly fragile state. So much so, that archaeologists from around the world have been flown in to work with the Jawoyn and restore it. “Once restored, we’re hoping to open this location exclusively to Cicada guests as another helicopter destination, nobody else.” reveals Clive. Apparently there’s something pretty special about named places, too. Getting there: From Darwin, it’s a 350-kilometre drive south-east via Katherine. Staying there: There are 18 rooms at Cicada Lodge, each designed for couples. However if you do decide to bring the kids along, staff can rearrange a room to cater for two extra beds. Prices start at more than $600 per room per night (based on twin share), which includes breakfast, ‘Welcome to Nitmiluk’ sunset drinks and appetisers in the evening. However more inclusive packages are available so you can experience more of the area. Need to know: Although Cicada Lodge provide a tube of sunscreen in every bathroom, we’d recommend bringing your own. This is the outback and the sun has extra bite.